Jane Yolen has been called the “Hans Christian Andersen of children’s literature,” and the first entry in this anthology proves that title is well deserved. Then he meets the Ice Maiden, who grants him three wishes. The ending of this tale is truly comparable to the bittersweet finish to any of Andersen’s own fairy tales. In “Lost Girls,” a turn on Barrie’s Peter Pan, a strong-willed girl is whisked away to Neverland, where she meets not one, but 15 girls, all named Wendy because Peter can’t bother remembering their real names. The girls meekly cook and clean and tend, and build up Peter’s ego while the Lost Boys play and eat and fight Captain Hook. Young Darla isn’t having any of that, however. “‘What you all need,’ she said grimly, ‘is a backbone transplant. It’s clear the Wendys need to go on strike.’ Being the daughter of a labor lawyer had its advantages.” What happens after that shakes Neverland to its foundations. “Belle Bloody Merciless Dame” introduces us to Sam Herriot and his meeting with an odd lass on the Western Riding one June. Is she elf or human, magical being or merely a zoned-out junkie? Whichever, young Sam is about to have an adventure with a Belle Dame sans Merci of another kind. There are 16 stories in all, featuring real persons such as Emily Dickinson and Edgar Allan Poe, as well as fictional characters, like Alice of Wonderland fame. Robin of Locksley is there, blessed at his birth by the Lady of the Greenwood and given his name. Jane Yolen is the author of more than 350 novels, graphic novels, and nonfiction. She’s the recipient of numerous book awards, including the Nebula and World Fantasy. 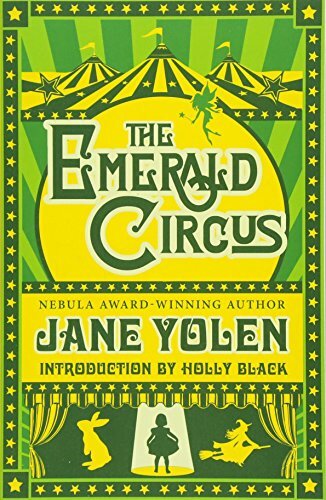 The Emerald Circus, with an introduction by fellow author and fan, Holly Black, gives us the reasons why she’s been so recognized, and the stories themselves attest to this fact. Often told with a tongue in cheek tinge of humor, they quickly glide into a darker realm where anything can happen and invariably does, much to the recipient’s dismay. Not quite science fiction, something other than fantasy, like Hans Christian Andersen’s tales, these stories seem more than fairy tales, the twist of their endings staying with the reader long after the book is closed.